This is a sophisticated, asymmetrically shaped wrap knit in reverse stockinette stitch with a zigzag lace panel and a twisted knit stitch column in a contrasting color. The inspiration for this accessory comes from traditional Japanese Zen gardens I’ve been fortunate enough to visit over the years. There is typically a carefully raked sand or gravel bed, resembling ripples on water, against which a few elements are carefully arranged. 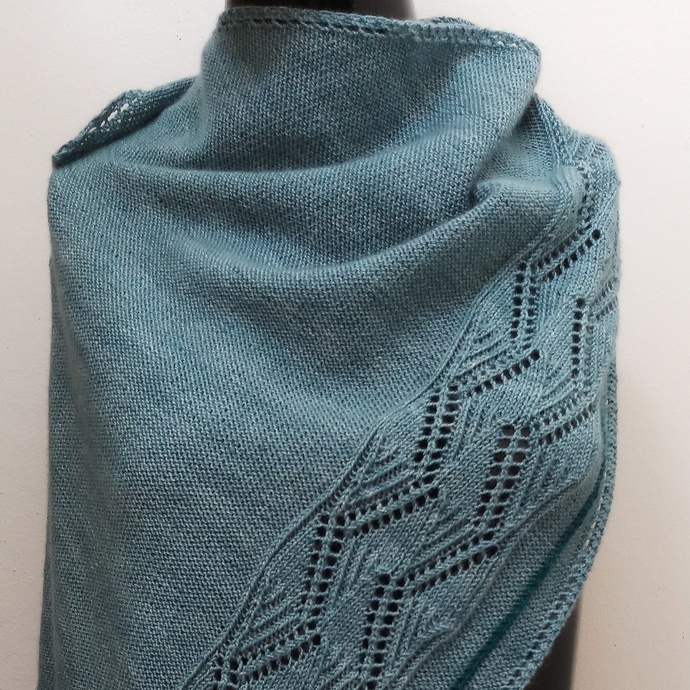 In this shawl, the raked background is created with reverse stockinette stitch, and there are two elements added: a lace knit panel of geometric design and a twisted knit stitch column in a contrasting color. The yarn is a 100% luxury wool, hand dyed in a semi-solid medium blue-green with a contrasting column in a dark blue-green. The shawl measures 52x27" / 132x69.5cm.